Remove grease, orange peel, oil spills and tire marks. Easy maintenance and stain resistant. Cost-Effective way of solving dust problems. Increases concrete floor durability up to 540%. Enhance appearance of your concrete by transforming it a into colorful, polished, clean surface. 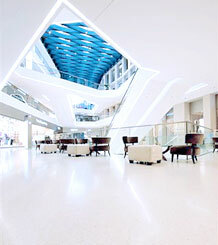 Convert ordinary concrete floors into a High-Gloss clean and polished concrete. We provide cost effective concrete floors that are durable, sustainable, and beneficial for long-term usage. SLEEK FLOORS offers a state of the art concrete polishing system that is the most innovative one of its kind on the market. Sleek Floors is the new way to clean and polish existing concrete for residential, commercial, and industrial concrete floors. SLEEK FLOORS system is the most effective solution for polishing old and new concrete floors at a fraction of the cost of traditional treatments. We will help you determine the most efficient, cost–effective, and eco-friendly way to clean and polish your concrete floors.